Today we have another guest post for you. I recently enjoyed a visit from a friend I have known for many years and don’t get to see very often. 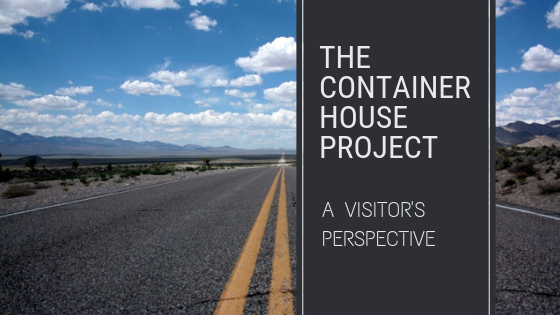 She kindly and voluntarily wrote up a guest post for this blog and although I’m sure she’s exaggerating somewhat below, we know you’ll enjoy her visitor’s perspective of our project. Sadly, I can’t share with you any links for Lara’s other work. Although Lara has written some very interesting pieces over the years, she’s not sharing anything online at the moment. Well, I’ve seen it! I have visited the Container-House-in-progress. In fact, I camped there for two nights. Top that if you can! Ashley and I have been friends since the days of Mrs Salmon’s Latin lessons (in between translating anecdotes about the twins Loquax and Anti-Loquax, she regaled me with stories about her attempts to bath her cat), and although we’ve lived at opposite ends of the world for nearly twenty years now, we’ve kept in contact and I went to visit her recently. I have always been astonished at Ashley’s resourcefulness and ability to learn new skills. When she needed a party dress, she hauled out the sewing machine and made herself a gorgeous ballgown, with whalebone corset and all. When her friend needed new plumbing installed, Ashley tootled over there and spent a Saturday afternoon fitting pipes. (Editor’s note – that was Kevin. I just passed tools around). When a client of hers needed a cover for his aeroplane, Ashley procured some canvas and whipped up a plane cover. When an acquaintance mentioned his desire to have his company logo marked on his car, Ashley sat down at a vinyl cutter and learned to cut logos out of vinyl. Then, of course, she met Kevin, who can make anything. Tell him you want a gate on wheels; he’ll make you a gate on wheels. Tell him you want a bicycle; he’ll make you a bicycle. Tell him your living room is too dark; he’ll fit lights all over the place for you. Tell him you’re hungry; he’ll whip up a bean chili. Together they are unstoppable. And now they’re making a house. Tank and Max, for whom a piece of rope is the last word in exciting toys. The containers. For now they are just metal shells, but soon enough they will be a home. The ditch. I was hoping to see tadpoles but they’ve turned into frogs and hopped away now. Taffy the cat occasionally wanders in with one. Pipes. They are going to be buried in a ditch and have slits cut along them, so water that drains into the ditch gets channeled into the pipes to be carried away. Did you know you could do that with pipes? Taffy the cat. She’s a shy kitty but very sweet and has a purr like a pneumatic drill. Maybe she is a pneumatic drill. Maybe she’s the one who’s been digging those holes. The goats. I have seen the goats; I have stared them in the square-pupilled eye and fed them potato peels and my happiness is truly complete. Next post: We Bought Building Sand and Stone. Why?